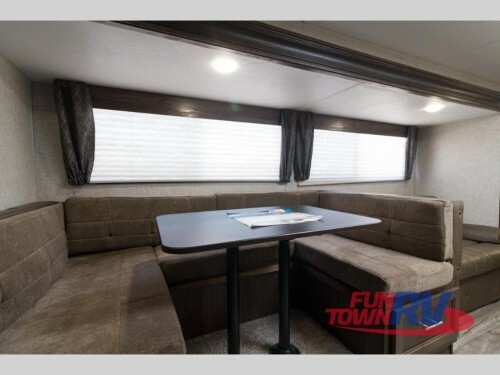 Check out the amazing features of the Cherokee Grey Wolf travel trailers for sale here at Fun Town RV! With many floorplans to choose from and some featuring space for as many as eight people, you can enjoy these RVs whether your family is large or small. Let’s take a look inside in this Cherokee Grey Wolf travel trailer review. 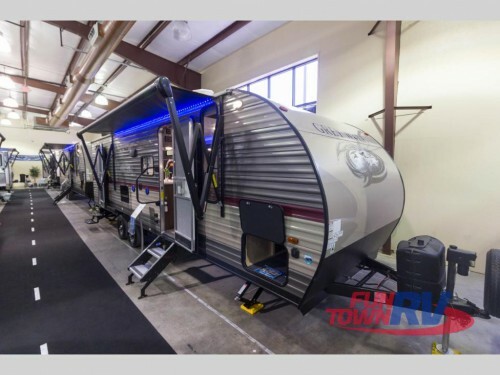 Check out our Cherokee Grey Wolf Travel Trailers! As soon as you step up to the Cherokee Grey Wolf, there will be plenty of amenities to take your camping life to the next level of comfort. For example, the built-in patio awning will provide your very own shaded area where you can rest and relax all day long. Plus, with outdoor speakers and an optional exterior bar and grill, you’ll love all of the ways you can enjoy more time outside. Spacious interiors and bunk bed floorplans make this the perfect RV for the family. 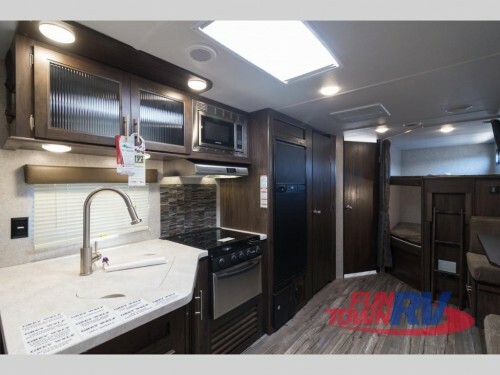 The interior of this travel trailer will come with up to two slides to provide the perfect amount of room for your entire family. Some models will even come with its very own set of bunk beds to make that extra space for a full kitchen and bathroom as well as have comfortable sleeping spaces for everyone. Bring more comfort on the road! Speaking of the full kitchen and bathroom, every Grey Wolf will have all that your family needs for a home-on-wheels. The combination kitchen and living room will come with a U-shaped dinette and flat screen TV for family movies or game nights. And with high quality appliances including a double door fridge with stainless steel upgrade option, making meals at the campground will be a breeze. As you can see, there are lots of items to love about our Cherokee Grey Wolf travel trailers. If you are ready get away with your family, be sure to contact us or stop by any of our locations today!